Description: One of five maps added by Fries to his edition of Waldseemuller's Geographia based on the Ptolemaic projections of South East Asia. Description: Northern China,Tartary and Japan. Description: Malay Peninula. Rare and early woodcut after Ptolomey. Description: Early copper-engraved map of Southeast Asia, including Malaysia, Burma, Java, Sumatra, Timor, and Indochina. One of the earliest available modern maps of the region. Description: Moluccas. Early map East Indies. Coloured. Description: East Indies and Nova Guinea. Miniature. Coloured. Description: Early rendition of India, Indo-China and the Philippines from the Dutch Golden Age. Original colour. Description: Interesting miniature map of India and the Far East. Latin text on verso. Coloured. Description: Charming minature map of Borneo, Sumatra, Malaysia, Cambodia and Siam from East to West. Coloured. Description: Charming minature map of Indonesia. The Moluccas including Celebes and Timor. Coloured. Description: Beautiful miniature map of South-East Asia, from India to China. Major ports and trading cities have been highlighted in gold paint. Coloured. Description: Early map of South East Asia. 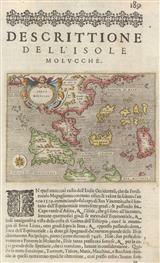 English text on verso describing a voyage to the Spice Islands by Humphrey Fitzherbert in 1621. Coloured. Description: Beautiful early map of Southeast Asia. Has a reference to Drake's important landing on the south side of Java. Coloured. Description: Striking copper-engraved map of South East Asia. Johannes Cloppenburgh Edition, with French text on verso. Coloured. Description: Early coloured map of South East Asia, from Sumatra to New Guinea, published by Cloppenburg.